Discussion in 'General Freemasonry Discussion' started by Payne, Dec 8, 2009. 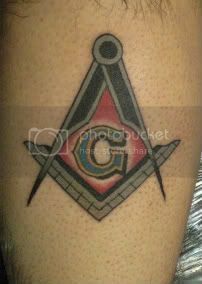 I've been thinking about getting a Masonic Tattoo for a while now and I have not decided what to get or where I'd place it on my body. I was wondering if any of you have Masonic Ink and if so What is it and Where did you put it and why? I have added an image I like but would change if I do get it on my skin. I like the overall look just feel it needs a few changes. I've actually been talking about getting the square and compasses on the left side of my chest. Something similar to my avatar here. Man I think that is great looking.. ! but I am too big a sissie to sit there that long.. ! That does look great. Thanks for the artist info as well. I am kicking around a tattoo but just not sure the design. I have a old nasty tat on the outside of my left leg that is due for a coverup, let Johnny in on the design, he really likes to get creative. I told/gave him the generalities of what I wanted and he did the rest. 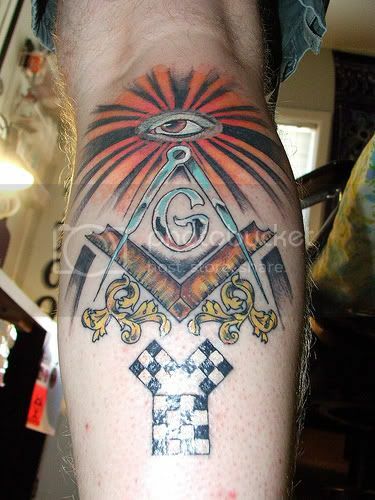 He really likes his Masonic Ink, several other Brothers have used him as well, all with equally good results. That'll look good! Nice choice of colors together! Sweet! What does something like that cost? Where do you lodge out of as well, Arlington is right down the road? lmao.. ! only place better would be the lower back.. ! Here is mine. Done by Stephen Noska of Southside Tattoos at 1313 S. Congress next to the Continental Club. Arlington is Johnny's home Lodge. Stated meeting, first Monday of the month. Come visit. I don't remember the actual final cost. I gave Johnny some freedom to be creative. 2 sessions, second session was much shorter in lenght, it was mostly to apply the white. Maybe a few hours total time. He is good about taking care of his Brother Masons on cost. Here is my new tattoo.